It was a fantastic day in Glen Coe today. Chilly but lots of blue sky with white fluffy clouds all day until 5pm. We started by climbing the Pap of Glencoe from the Long Leven side; the steepest side but no track. Good views from the top along the lake and across to the Mamores mountains were spectacular. Ben Nevis was in cloud though but better was to come. From here we went down to the pass and then it was a long uphill haul to Sgorr nam Fionnaidh (967m), the Munro at the end of the Aonach Eagach ridge. 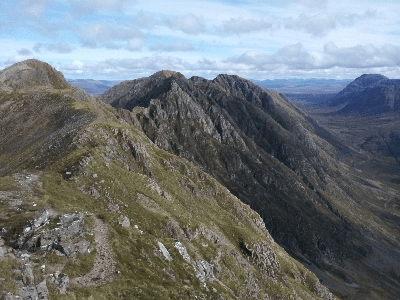 This gave us the first view of the Aonach Eagach ridge. It was after 2pm and the light and sky were great. I used an orange filter with Ilford FP4 roll film in my Mamiya 7 camera. I thought there were better views further along the ridge so down I went to it. 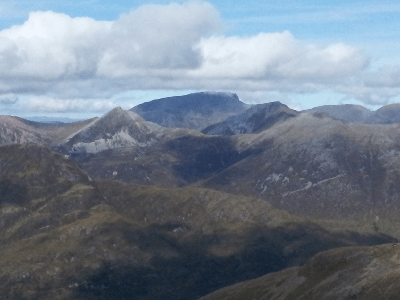 The shots of the ridge were great as well as views to Ben Nevis, highest peak in Britain at 1344m. We ended the day by checking out the waterfalls on the uphill side of the Clachaig Inn, near the A82. The falls were well lit at 5pm but the hills behind could have have been brighter. Somehow we then found ourselves at the Clachaig Inn. They had a new dark ale just on from the An Teallach brewery called Hector. I tried it several times to check it was jolly nice and not just a fluke with the first pint, you can’t be too careful these days! Oh, and the food was jolly good too.